Did you just receive e-mail with a password protected ZIP file attached to it, or did you just download a ZIP file and don’t know the password? 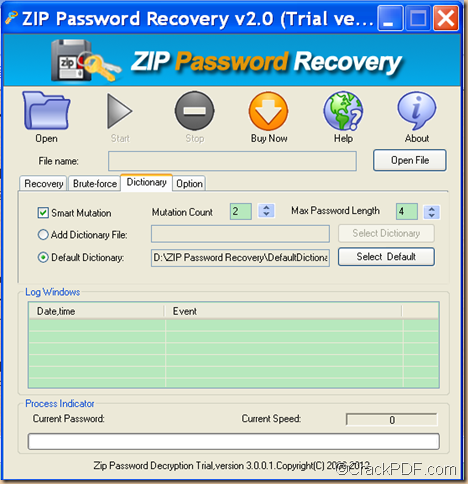 CrackPDF ZIP Password Recovery will be a good assistant for you to restore ZIP password. ZIP files contain one or more compressed files, which makes it easy to combine related files together and makes sharing, e-mailing, downloading and storing data and software faster and more efficient. The ZIP format is the most popular compression format used in Windows environment, and WinZIP is the most popular compression utility. 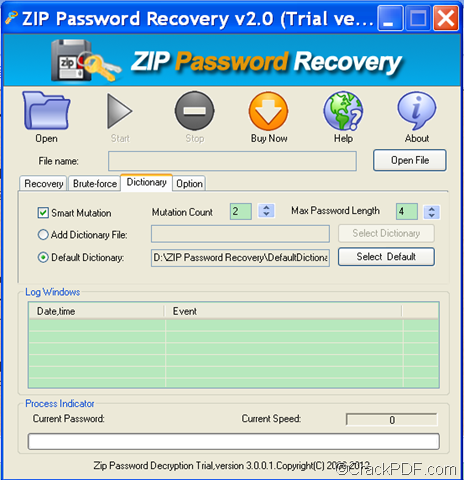 CrackPDF ZIP Password Recovery is professional recovery tool that can help you recover ZIP password in case you forgot or lost the passwords for your ZIP/WinZIP/PKZIP archives. In the following paragraphs, you will see how to use this application to retrieve ZIP password. Firstly, please download CrackPDF ZIP Password Recovery. After the download, please double click it and follow the setup wizard to install it on the computer. Secondly, please open the application and click the Open button in the tool bar on top of the user interface or click the Open File button beside the “File name” input box to add the password-protected ZIP file into the application. On this interface, if you check the radio button of “Smart Mutation”, you are able to set the mutation count and max password length. If you the radio button of “Add Dictionary File”, you also add your own dictionary, which contains your usually used passwords such as your birthday, the name of your pet, your favorite color, etc., to the application. Lastly, please click the Start button in the tool bar on top of the interface to start to recover the ZIP file password. In the end of this article, if you are interested in CrackPDF ZIP Password Recovery, please download the free trial of it via clicking the following button.